Step 1 Peel the carrots and cut them into chunky slices on the diagonal. Place in a large saute pan and pour over enough cold water to just cover. Add the honey, butter, thyme and a generous pinch of salt. Place over medium heat and bring to a boil, then lower the heat to a simmer. Cook until the carrots are almost tender, about 15 minutes. Step 2 Now, turn up the heat to boil the liquid rapidly until reduced to a shiny, sweet glaze -- there should be 1 to 2 tablespoons of intensely flavored cooking liquor coating the carrots, nothing more. Squeeze over the lemon juice and check the seasoning. You'll need a turn of the pepper mill and a pinch or two of salt, but no more. Step 3Just before serving, sprinkle over the lemon zest. In Recipes-list.com we have selected the most viewed recipes from category - Vegetables Vegetarian . Enjoy the best recipes specially selected for you! 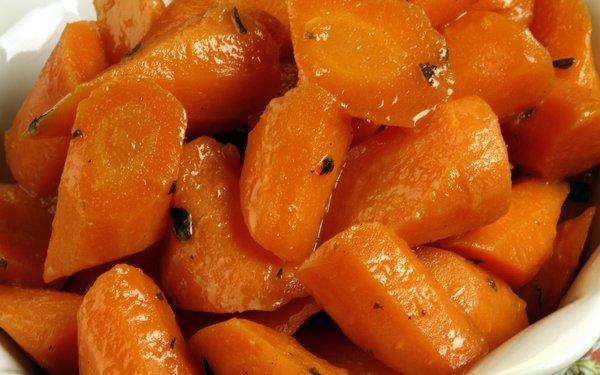 Carrots with honey, lemon zest and thyme is the right choice that will satisfy all your claims.